If reports in the media are anything to go by then Manchester United are interested in luring a few English players to strengthen their team. 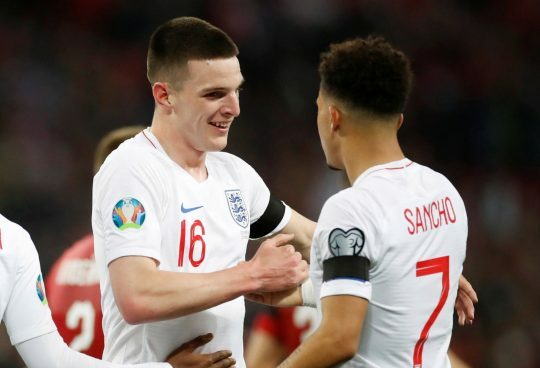 According to an exclusive story covered by The Sun, Dortmund’s £80million-rated Jadon Sancho and West Ham’s £40million-rated Declan Rice are on top of Man United’s hit-list. The British outlet have further mentioned that Solskjaer will also move for an English defender should any defender leave Old Trafford in the summer transfer window. The names of Wan-Bissaka and Maguire are on the wish-list. Rice is a talented defensive midfielder and he could be a long term replacement for Serbian international Nemanja Matic. On the other hand, we do need quality and depth in the wide attacking positions and in my view, Sancho would be a world class signing if Solskjaer can somehow lure him from the German club. My main concern is that we have to make our defense stronger even if no one of the back-line leaves in the summer. Veteran fullbacks like Valencia and Young should be replaced and therefore, someone like Wan-Bissaka is needed. As far as the central defense is concerned, United do have depth with players like Jones, Smalling, Rojo, Lindelof and Bailly around but we do lack quality and a leader, who could effectively command the back-line. Therefore, a top quality central defender must be hired. I do not think that the United supporters would mind if the club opts to offload one or two center backs from our current crop to get the key signing done.